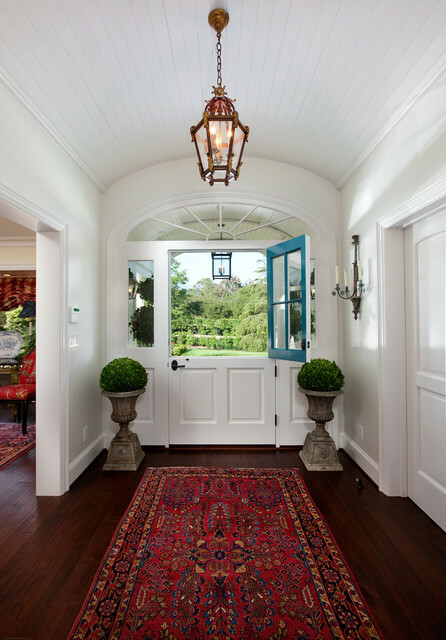 American Colonial Revival - Traditional - Entry - Santa Barbara - by Giffin & Crane General Contractors, Inc.
Front Entry Door - Where can I find the Front Entry Door? I'm also trying to find out the name of this color paint. Does anyone know what the color is called on the walls of the stairway? I WOULD LOVE TO KNOW THE DIMENSIONS OF THE DOOR PLEASE AND WHO MANUFACTURED IT. DIMENSION AND MANUFACTURER OF DOOR - PLEASE ANSWER....DIMENSION AND MANUFACTURER OF DOOR? Stunning! - Stunning entry, where was the rug purchased? Thank you. Francesca Wolfe was the interior designer for this project. Planters - I love your planters that are by the door! Please can you tell me where you got your planters. Thank you for your time. They were furnished by Francesca Wolfe, the interior designer. Please, Please tell me the color of the front door?? I'm sorry- we don't have paint colors on record. It was furnished by Francesca Wolf, the interior designer. What are the floors? - What are the floors? Color - Hi. 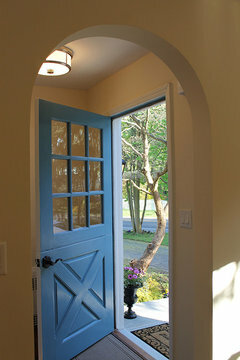 Can you tell me what color was used on the exterior of the door? Thank you! What color is the ceiling and walls. such a pretty white! 4. Urns. Typically seen in the garden or flanking front doors outside, these planters also can add classic garden shapes indoors. Try using one inside a nonworking fireplace, place a small pair of them on either side of the mantel, put one atop a side table or use them inside the front door. Kind of cool in foyer if it makes sense...doesn't have to be rounded....we just like some sort of small foyer.